The web has been all aflutter with news of Dave Winer's latest, greatest invention, the ability to view web sites on mobile devices, which he calls "A River of News". Neat metaphor, but the approach he takes, which amounts to little more than scraping poorly authored web sites and stripping out most of the crufty presentational HTML, is wrong-headed, a gnarly hack. As Danny Ayers points out in the comments to a post by Doc Searls, there are reams of documentation on best practices for authoring web sites to allow them to display on a wide variety of devices. Winer's approach removes all branding from the sites in question, something that is absolutely unnecessary to display a site on mobile devices. It also requires visiting a different address than the normal address for a web site, which also harms the brand of the site in question. About six weeks ago, I detailed the steps I took to make There Is No Cat work properly on mobile devices. From the user's perspective, there's no need to visit another site. From my perspective, I largely maintain my design and associated branding, adapted for the small screen. So, to show what this can look like for those of you without appropriate mobile devices, I shot a couple of photographs of this site being displayed on a couple of mobile devices. 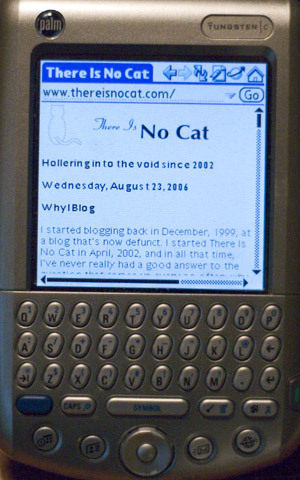 First, There Is No Cat as seen on my Palm Tungsten C, using the browser WebPro 2.5. I understand that Treos come with a later version of this browser, and it has a different name now, but the user experience should be similar. The background is missing, but the top graphic is still there, and legible. The text is perfectly readable. 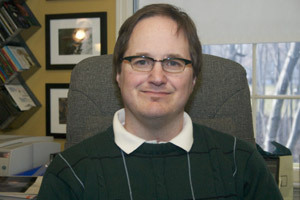 The site has been reformatted to fit into a single column on mobile devices rather than the three columns shown on a computer. The user experience is comparable to that of a computer user, but tailored for the small screen. The browser here is Internet Explorer Mobile. The elements of my design are largely still present. I created an alternate background graphic that presents the same kind of look and feel on smaller devices; the squares that make up the graphics are about a quarter the size they are on a computer. The header graphic is still present. The background I use for dates is different; rather than use the amorphous shape I use on a full-sized computer, I just set an identical background color; that way the background expands to fit the size of the date text when needed. On the larger computer, my graphic is pretty much large enough to fit any potential date, but it wasn't so easy to do that for mobile devices, so I compromised. But by and large, the elements of my design are still present. And look at the URL in both of these screen shots. They're exactly the same as the URL a large screen computer user would use. The HTML is exactly the same. It took me about an hour to create the CSS stylesheet and graphics and make one minor adjustment to my HTML to read in the mobile stylesheet. I don't have to worry about ensuring that the data on my mobile site is synchronized with that on my mainstream site; they're exactly the same site. 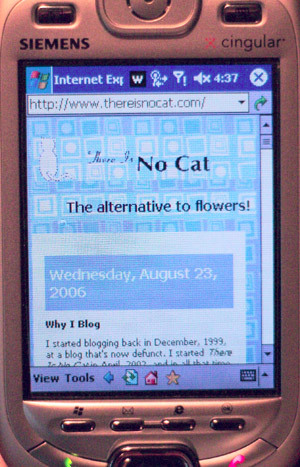 Users don't have to remember to go to thereisnocatriver.com, or pda.thereisnocat.com; the exact same www.thereisnocat.com URL works as intended in their mobile devices. I just know Winer's going to make another several million dollars off this move. And in doing so, that's going to set back the idea of creating standards-based sites as companies spend millions of dollars to create separate River Of News-compatible sites. But it shouldn't be that way. A conscientious web site developer who knows how to create a compelling design without using crufty HTML can create a more compelling user experience that better serves the branding needs of their clients. River of News takes the 1990s HTML "anything goes" attitude and validates it, when it should be standards-compliant code being validated. That's a mistake, a huge and potentially needlessly costly step in the wrong direction. Not to mention that it's already hard enough to convince those web developers still stuck in 1998 that developing sites to web standards is best practice. Gnarly hacks like River of News don't help.